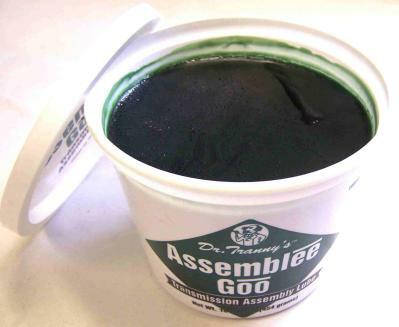 Assemblee GOO Assembly Lube YOU NEED THIS! This is the best Assembly Lube we have found to make the packing of cluster needles, input to mainshaft rollers, differential bearing assembly, transfer case assembly, ect. Very easy and trouble free. This is a great all around assembly lubricant as well as needle bearing retaining compound. If you are rebuilding a Muncie, another type of transmission, Differential, or transfer case, don't forget the ASSEMBLEE GOO!